Michael Stewart saw red in his first game as Hearts captain as Danny Cadamarteri's two debut goals secured Dundee United a victory at Tannadice. Cadamarteri got his United stay off to a flier by opening the scoring from the spot after four minutes when Eggert Jonsson upended Danny Swanson. Stewart was sent off seven minutes after the break for scything Scott Robertson to earn a second yellow card. Cadamarteri broke clear to score again after 85 minutes to kill off Hearts. Until Cadamarteri struck for a second time, the 10 men had been a constant threat in an untidy and tousy tussle at Tannadice in the last of the opening Scottish Premier League fixtures. The forward who started his career at Everton had been partnered by David Goodwillie up front in the absence of the injured Francisco Sandaza, Jon Daly and Damian Casalinuovo. Hearts had four summer signings in their starting line-up, but it was Cadamarteri - one of a trio of United acquisitions - who made the biggest impact. Visiting manager Csaba Laszlo had decided to rely on Eggert Jonsson, a more natural midfielder, to fill the right-back spot after Robbie Neilson's departure and United's Danny Swanson made Hearts pay for that after four minutes. The Iceland international clumsily felled the United midfielder just inside the box and Cadamarteri's penalty just evaded goalkeeper Marian Kello's outstretched hand. Hearts were lucky not concede a second penalty after 18 minutes when referee Steve Conroy did not even give a foul when Cadamarteri was clearly felled by summer signing Ismael Bouzid's outstretched leg on the edge of the box. The referee might have been playing advantage as Goodwillie swept through on goal, but Kello, who had been preferred to Janos Balogh, gathered as the forward overran the ball. However, with both sides struggling to deliver any flowing football, it was Hearts who became the greater threat. Ruben Palazuelos fired a drive straight at Nicky Weaver from just outside the box and the goalkeeper then did superbly to push clear David Obua's low effort from slightly closer range. Obua forced Weaver into another one-handed stop to block a dangerous low cross into the six-yard box as Hearts started the second half on top. Goodwillie went close from a difficult angle at the other end before Hearts lost Stewart after the midfielder rashly clattered Robertson from behind. The 10 men were unlucky not to win a penalty when Suso appeared to be felled by Mihael Kovacevic. United settled and Kello was forced into a fine save to turn a close-range Goodwillie volley over the crossbar from substitute Craig Conway's cross and an Andy Webster header struck the far post from the resulting corner. Cadamarteri broke clear to settle the game after 85 minutes when he raced from the halfway line to gather a Prince Buaben through ball to steer it past the outrushing Kello. A Jonsson header forced Weaver into another flying save, but it was United who finished with a victory they just about deserved. "It was a nervous time for us as I thought we had a good pre-season and I thought that last season and it did not work out that way. "But the importance of the game and the team that we were playing against kept us focussed. "That's one point more than we had after five games last year, so from that point of view it's a good start. "We are trying to get a balance between a hunger and nice tempo and at times I thought we were doing things at a rush, but the important thing is we deserved to win." "The most important thing is to take some positives out of the game. "The negative was the red card, but he performance was okay. "We played with 10 guys and we played good football and had some good chances. I thought at this moment to lose 1-0 or 2-0 does not matter as we had to try to score. "We lost, but we can still beat Zagreb and and Rangers in our next matches." 90:00+3:17 The game is over, as the referee blows his whistle. 90:00+1:12 Corner taken right-footed by Suso Santana from the left by-line to the near post, Scott Robertson manages to make a clearance. 89:23 The ball is swung over by Craig Conway, save by Marian Kello. 87:46 Corner taken by Suso Santana from the left by-line. Ismael Bouzid takes a shot. Nicky Weaver makes a save. Corner taken right-footed by Suso Santana, Sean Dillon makes a clearance. 86:59 Prince Buaben has an effort at goal from 30 yards. Save made by Marian Kello. 85:49 Substitution Danny Cadamarteri leaves the field to be replaced by Andis Shala. 84:02 Assist by Prince Buaben. 84:02 GOAL - Danny Cadamarteri:Dundee Utd 2 - 0 Hearts Danny Cadamarteri grabs a goal from long range low into the middle of the goal. Dundee Utd 2-0 Hearts. 83:33 Unfair challenge on David Obua by Darren Dods results in a free kick. The free kick is delivered right-footed by Ian Black from right channel, clearance made by Scott Robertson. 82:38 Ismael Bouzid challenges Danny Cadamarteri unfairly and gives away a free kick. Craig Conway crosses the ball from the free kick right-footed from left wing. 81:48 Craig Conway sends in a cross, clearance by Ismael Bouzid. 79:26 Corner taken right-footed by Suso Santana. 79:26 Substitution Sean Dillon is brought on as a substitute for Michael Kovacevic. 79:26 Jose Goncalves delivers the ball, Paul Dixon gets a block in. 77:20 Substitution (Hearts) makes a substitution, with Arvydas Novikovas coming on for Christian Nade. 77:20 Craig Conway produces a cross, David Goodwillie takes a shot. Marian Kello makes a save. Corner taken by Craig Conway, Header from close range by Andy Webster strikes the post. 76:42 Craig Conway sends in a cross, clearance by Ismael Bouzid. 76:20 Ian Black takes a shot from 25 yards. Blocked by Darren Dods. 75:59 The ball is delivered by Ruben Palazuelos, Paul Dixon makes a clearance. 73:42 Free kick awarded for an unfair challenge on Ruben Palazuelos by Morgaro Gomis. Ian Black takes the direct free kick. 72:32 Direct free kick taken by Marian Kello. 72:32 Substitution Daniel Swanson leaves the field to be replaced by Craig Conway. 72:32 Unfair challenge on Dawid Kucharski by David Goodwillie results in a free kick. 70:53 Christian Nade is flagged offside by the assistant referee. Direct free kick taken by Nicky Weaver. Correction - 69:48 Daniel Swanson has an effort at goal from 18 yards. David Obua gets a block in. Inswinging corner taken from the left by-line by Daniel Swanson, Marian Kello makes a save. Scott Robertson takes a shot. 69:48 Daniel Swanson takes a shot. David Obua gets a block in. Inswinging corner taken from the left by-line by Daniel Swanson, save by Marian Kello. Scott Robertson takes a shot. 68:31 Eggert Jonsson gives away a free kick for an unfair challenge on Danny Cadamarteri. Daniel Swanson crosses the ball in from the free kick. Danny Cadamarteri delivers the ball, Eggert Jonsson gets a block in. Inswinging corner taken from the left by-line by Daniel Swanson, save by Marian Kello. 68:10 Suso Santana is ruled offside. Nicky Weaver restarts play with the free kick. 67:07 Free kick taken by Michael Kovacevic. 67:07 Booking Booking for Daniel Swanson. 66:50 Booking Ian Black goes into the referee's book. 66:43 Booking Suso Santana is cautioned by the ref for dissent. 65:55 Ian Black gives away a free kick for an unfair challenge on Daniel Swanson. 65:11 Ian Black takes a inswinging corner from the left by-line played to the near post. 64:47 The referee blows for offside against Danny Cadamarteri. Ismael Bouzid takes the free kick. 63:31 Free kick awarded for an unfair challenge on Eggert Jonsson by Prince Buaben. Suso Santana takes the direct free kick. 62:26 Free kick awarded for an unfair challenge on Jose Goncalves by David Goodwillie. Marian Kello takes the free kick. 61:47 Suso Santana takes a shot from 35 yards and went wide right of the net. 60:52 Danny Cadamarteri challenges David Obua unfairly and gives away a free kick. Free kick taken by Jose Goncalves. 60:24 David Obua challenges Michael Kovacevic unfairly and gives away a free kick. Direct free kick taken by Nicky Weaver. 59:52 David Goodwillie is ruled offside. Marian Kello takes the free kick. 58:04 Michael Kovacevic sends in a cross, Marian Kello makes a save. 57:44 A cross is delivered by Paul Dixon, Jose Goncalves makes a clearance. 55:09 Christian Nade gives away a free kick for an unfair challenge on Andy Webster. Free kick taken by Andy Webster. 54:36 Substitution Ian Black replaces David Witteveen. 52:47 Long range shot by David Witteveen goes wide right of the target. 51:47 Andy Webster takes the direct free kick. 51:47 Sent off Michael Stewart receives a red card for second bookable offence. 51:28 Michael Stewart gives away a free kick for an unfair challenge on Scott Robertson. 50:52 David Goodwillie produces a right-footed shot from deep inside the six-yard box which goes wide of the right-hand post. 49:44 Danny Cadamarteri concedes a free kick for a foul on Michael Stewart. Ismael Bouzid takes the free kick. Correction - 49:14 Shot from long range by Prince Buaben misses to the right of the goal. 49:14 Prince Buaben takes a shot from a long way out which goes wide of the right-hand post. 48:38 A cross is delivered by David Witteveen, Nicky Weaver makes a save. 48:11 Centre by Suso Santana, Nicky Weaver makes a save. 47:27 Centre by Daniel Swanson, save by Marian Kello. 45:49 David Goodwillie gives away a free kick for an unfair challenge on Jose Goncalves. Marian Kello takes the direct free kick. 45:00+1:33 The referee calls an end to the first half. 45:00+1:18 The ball is swung over by David Goodwillie. 45:00+0:06 Ismael Bouzid takes the free kick. 45:00+0:06 Booking Michael Kovacevic goes into the book. 44:58 Foul by Michael Kovacevic on Christian Nade, free kick awarded. 44:34 Paul Dixon crosses the ball. Correction - 44:09 The referee blows for offside. Andy Webster takes the free kick. 44:09 David Witteveen is caught offside. Nicky Weaver takes the free kick. 44:00 The ball is delivered by Danny Cadamarteri, Ruben Palazuelos makes a clearance. 42:48 Shot from 18 yards by David Obua. Nicky Weaver makes a save. The assistant referee flags for offside against Suso Santana. Indirect free kick taken by Nicky Weaver. 42:27 The ball is delivered by David Obua, clearance by Darren Dods. 40:02 Ruben Palazuelos concedes a free kick for a foul on Scott Robertson. Darren Dods restarts play with the free kick. 37:19 David Witteveen takes a shot. Nicky Weaver makes a save. 35:57 The assistant referee signals for offside against Christian Nade. Free kick taken by Nicky Weaver. Unfair challenge on Michael Stewart by Paul Dixon results in a free kick. Ismael Bouzid restarts play with the free kick. 34:24 Booking The referee cautions Andy Webster for unsporting behaviour. 34:15 Free kick awarded for a foul by Andy Webster on David Obua. Free kick taken by David Obua. 33:41 Danny Cadamarteri sends in a cross, Marian Kello makes a save. 31:37 Morgaro Gomis challenges Jose Goncalves unfairly and gives away a free kick. Free kick crossed left-footed by David Obua from left wing. 30:15 Header from deep inside the area by David Witteveen goes over the bar. 29:47 Free kick awarded for an unfair challenge on Suso Santana by Paul Dixon. Eggert Jonsson takes the free kick. 28:23 Andy Webster gives away a free kick for an unfair challenge on David Witteveen. The free kick is swung in right-footed by Suso Santana. 26:56 Corner taken right-footed by Suso Santana to the near post, clearance made by Andy Webster. Shot from just outside the box by Michael Stewart goes over the target. 26:13 The ball is swung over by Daniel Swanson, Eggert Jonsson makes a clearance. 25:35 Free kick awarded for an unfair challenge on Jose Goncalves by Michael Kovacevic. Free kick taken by Marian Kello. 24:02 Direct free kick taken by Andy Webster. 24:02 Booking Michael Stewart is shown a yellow card. 23:57 Free kick awarded for a foul by Michael Stewart on Daniel Swanson. 22:57 Ruben Palazuelos produces a drilled left-footed shot from 25 yards. Save made by Nicky Weaver. 22:50 The ball is sent over by Suso Santana. 22:27 Daniel Swanson gives away a free kick for an unfair challenge on Ruben Palazuelos. Michael Stewart restarts play with the free kick. 20:08 Booking The referee shows David Obua a yellow card. 18:49 Corner taken right-footed by Daniel Swanson from the right by-line, Marian Kello makes a save. 18:40 Morgaro Gomis crosses the ball, blocked by Jose Goncalves. 15:12 The ball is sent over by Morgaro Gomis, Marian Kello makes a save. 13:58 Free kick awarded for an unfair challenge on Suso Santana by Paul Dixon. Free kick crossed by Suso Santana, Andy Webster makes a clearance. 12:56 Michael Stewart gives away a free kick for an unfair challenge on Daniel Swanson. Paul Dixon takes the free kick. 11:04 Foul by David Obua on Prince Buaben, free kick awarded. Free kick taken by Andy Webster. 9:02 David Obua challenges Scott Robertson unfairly and gives away a free kick. Andy Webster takes the direct free kick. 7:49 David Goodwillie challenges Suso Santana unfairly and gives away a free kick. Free kick taken by Ismael Bouzid. 6:56 Foul by Paul Dixon on Suso Santana, free kick awarded. Direct free kick taken by Suso Santana. 5:47 Unfair challenge on Suso Santana by Paul Dixon results in a free kick. Free kick crossed by Suso Santana, Prince Buaben makes a clearance. 3:57 Foul by Daniel Swanson on Suso Santana, free kick awarded. Free kick crossed right-footed by Michael Stewart, clearance made by Prince Buaben. 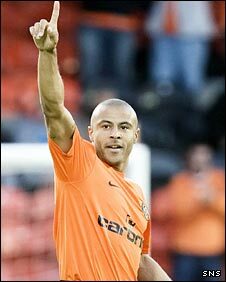 3:29 GOAL - Danny Cadamarteri:Dundee Utd 1 - 0 Hearts Danny Cadamarteri scores a placed penalty. Dundee Utd 1-0 Hearts. 2:39 Eggert Jonsson concedes a Penalty for a foul on Daniel Swanson. 0:08 Foul by Ismael Bouzid on Prince Buaben, free kick awarded. Daniel Swanson crosses the ball from the free kick right-footed from left wing, Marian Kello makes a save.